FotoMagico is a program specialized in the creation of photo slideshow on Mac platform. It offers an option for quick edition in order to have an original rendering. Editing: The program allows retouching the photos on the processing window before assembling them into slideshow. Depending on his preferences, the user will be able to crop the photo, adjust its orientation or just modify the borders. Protection: By adding watermark on each photo, the unauthorized operations as well as their fraudulent use are avoided. FotoMagico allows the user to define and modify its size and place on the pictures. 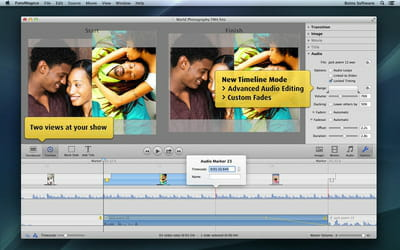 Slideshow: This software is equipped with a track editing which offers the user the possibility to assemble different photos in a single file. The duration of each slideshow as well as the chosen transition effect are customizable depending on the expected results. Audio files can be imported and used as background music during the slideshow. FotoMagico has a library containing several transition effects templates and many predefined audio background. The software also has a photo manager option allowing to import or delete them via the main interface. Latest update on August 24, 2015 at 06:31 AM.